I ended up doing more than I anticipated yesterday, thanks to the permission to do absolutely nothing. Maybe that's the secret...tell myself that I have absolutely nothing to do and can just sit on my heiney all day. Whenever I do this, I seem to naturally putz through at least five or six things. Yesterday it was laundry and bed changing and organizing at my desk. It was very slow going for some reason, but I did finish the moteef in the upper right corner. That puts me at a little over half way done with this one, so I am pretty happy with that. Time to leave for dialysis, so I suppose I better get moving. It is a cold eleven degrees outside, so I need to bundle up and get the car cleaned off and warmed up before heading that way. Happy Monday, Dearies! I hope your day is wonderfully swell! Come tell me all about it! Good for you on getting a few things accomplished yesterday, Coni! I like the motif you added to the Winter Quaker. Wishing you a smooth sailing day! Another great project. It helps me to remember this saying: Life is what happens when one is making plans for it. 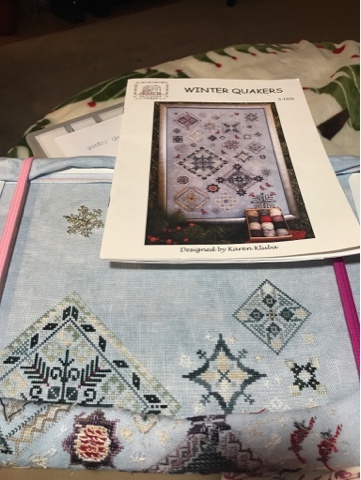 Your Winter Quaker piece is so pretty, and I love the fabric.Hope your chair time goes smoothly today, and best of luck tomorrow! I'll be thinking of you! Winter Quaker's is one of my favorite wips of yours! Love those blues. My day is back to the office...no stitching today on lunch as I decided to go out with the gals for pizza buffet. But I have told myself that is my only day of lunch out this week, someone hold me to that!! Stitching on geraniums this evening, more onesy twosy stitches all evening. I think there's probably something in that: that if you give yourself permission not to do something, then doing it doesn't seem as onerous. Winter Quakers is gorgeous!! Congrats on the half way mark!